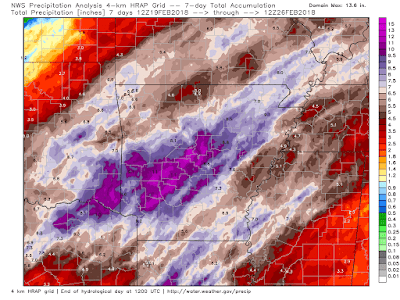 MWN Blog: Recap of Saturday's severe weather, and more rain?? Recap of Saturday's severe weather, and more rain?? Given the first Enhanced Risk outlook for Memphis since May 27 (you recall the Memorial Day weekend Tom Lee Storm right? ), we fared pretty well. Some of our neighbors not far to the north were not so lucky. A Tornado Watch was issued at 3:20pm - our first since August 31, 2017 - as a line of storms moved across Arkansas towards the metro. The most potent airmass would end up being just north of our area where Tornado Warnings were issued from northeast AR across northwest TN. Locally, Severe Thunderstorm Warnings were issued as far south as the I-40 corridor with straight-line wind generally peaking in the 40-50 mph range as the line moved through between 7-8pm, resulting in some scattered power outages but no major damage. By 8:30pm, the majority of the metro was receiving just rain, as the line continued pushing east. 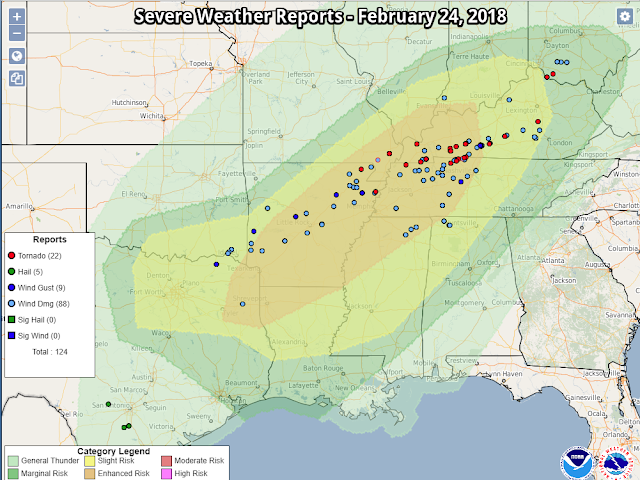 Unfortunately, severe storms dropped at least a couple of tornadoes in northeast AR, the Missouri Bootheel, and northwest TN, including an EF-1 that affected Keiser and Osceola, AR and an EF-2 that struck Malden, MO. Below you can see the severe weather outlook issued at 8am Saturday morning by the Storm Prediction Center, overlaid by the preliminary severe weather reports for the day. Overall, this was an excellent forecast with nearly all of the reports within the Slight (yellow) or Enhanced (orange) Risk areas. You can make out a southwest-to-northeast "path" of the damaging storms across AR to areas just north of the I-40 corridor into central KY.
Our Friday morning forecast indicated the timing of the storms would be between 8pm-1am Saturday night. That was adjusted Saturday morning to between 6-10pm, indicating the primary threat would be damaging wind and flooding, followed by a low risk of tornadoes. Overall, I feel that worked out quite well. Looking ahead - more flooding? While severe weather drew the most attention Saturday, precipitation that totaled 4-5" in the metro and nearly a foot in portions of central AR resulted in high rivers and tributaries and some instances of urban and flash flooding. River flood warnings continue across the region with the Mississippi River itself forecast to cross flood stage by this weekend and remain there for a couple of weeks, cresting about 2.5' above flood stage at Memphis. The next system arrives Tuesday night and continues through Thursday morning and promises to be another soaker. 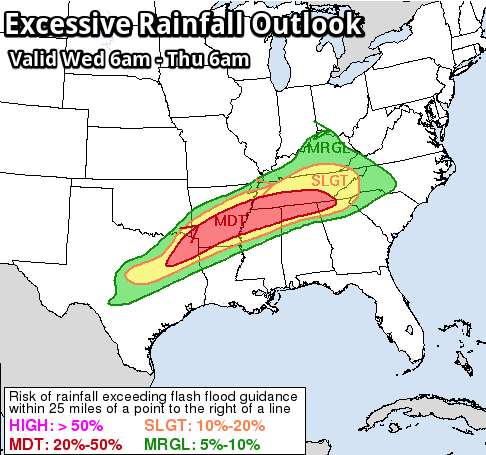 There appear to be two periods of potentially heavy rainfall - one Tuesday overnight and another Wednesday evening into the overnight hours. 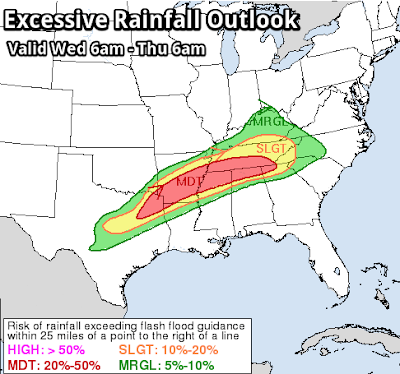 During the day Wednesday, rain chances remain high but amounts should be more manageable. By mid-day Thursday, I'm expecting another 2-4" of rain, locally higher, to have fallen across the area, which should push us over the all-time February rainfall record of 11.14". We're currently about 1.5" shy of that record. Flood Watches are again posted for this time period and rivers will only continue to climb as water simply can't soak in anymore and will run off into drainage areas and then local creeks and streams that feed the rivers. Once the system departs Thursday, sunny skies are on tap once again heading into the weekend. Could this be the first Saturday in nearly 2 months to be dry and sunny?? This week is also Tennessee Severe Weather Awareness Week (SWAW), so be sure to check out our SWAW webpage with new weather topics being added daily, as well as our social media feeds where we are giving away free MWN apps and NOAA weather radios this week! In fact, find our pinned post on Facebook and enter to win one of those Midland radios on Tuesday night! We're also running a sale on StormWatch+ in the MWN mobile app - only $5.99! That's a ONE-TIME fee for peace of mind in the form of personalized notifications when hazardous weather threatens. Learn more by clicking here.